This article outlines how to configure your incorporation types, set at division level within the CRM. This list is configurable to add new options and hide those not relevant for your business. The Incorporation Type can be found on the main details page on a division record. To configure your Incorporation Types you will require Prospect 365 Administrator rights, if you require these then please speak to your key CRM user or our Customer Services Team. To edit your Incorporation Types, click on the settings icon in the bottom left-hand corner. 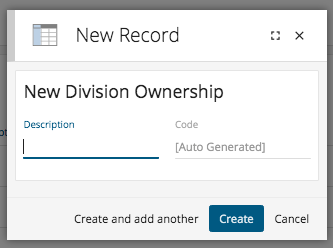 Once within the Settings Centre, navigate to the People & Places section & scroll down until you reach the Division incorporation type configure option. By selecting the 'Click to Configure' link the Configure Division Incorporation Types window will open. Within this window all of your current Incorporation Types will be listed. To add a new one click on the + icon in the top right-hand corner. Simply give your new Incorporation Type a name & click Create, then your new Incorporation Type will be available to be selected from the drop down list. Finally, you may wish to obsolete certain Incorporation Types that you don't tend to deal with. To do so click on the Bin icon against the required Incorporation Type & the selected type will then be obsoleted, no longer appearing in the drop down list. Please note any Divisions assigned this Incorporation Type will still remain.